Wedding Venues East Ayrshire ARE YOU A SUPPLIER? 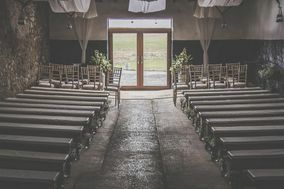 Guide to wedding venues in East Ayrshire: in our listings you will find the best venues to celebrate weddings and other events like anniversaries, birthdays, christenings and other unforgettable special occasions. You can take a look at prices and wedding packages in addition to the best offers in wedding receptions in East Ayrshire. You'll find the perfect combination of history and culture in East Ayrshire for your wedding, along with plenty of green spaces where outdoorsy types will feel right at home. As far as accommodations are concerned, your out-of-town-guests will have plenty of choices. There are four star hotels and tiny boutique bed and breakfasts, along with plenty of budget options. Staying fed won't be an issue here, as there is no shortage of fresh seafood to be had and lovely local meats and sweets. Be sure to recommend that guests try the traditional Ayrshire 'tatties'! As for finding your wedding venue in East Ayrshire, you can rest easy as there are plenty local options to explore, and plenty more in nearby Dumfries and Galloway. The hardest part will be choosing between them. Are you planning a traditional wedding? The wedding venues in East Ayrshire include stately manor homes and stunning castles, along with hotel and spa resorts where the staff will cater to your every whim. You'll also find beautifully restored barns, quaint little inns, and sprawling tracts of nature where you can host a rural celebration with every creature comfort you could want. Looking for something different? You can even celebrate your vows at the Burns Monument Centre! Why should you be using a wedding budget planner? Simply put, choosing between East Ayrshire wedding venues (and planning the rest of your Big Day) will be easier when you know how much you can comfortably spend. It Looks Lovely in Pictures, But Is It Really Picture Perfect? The only way to know if the Ayrshire wedding venues you like best are as nice in person as they are in pictures is to visit them. Of course, you can't possibly visit every wedding venue in Ayrshire, so your first step will be to make a list of your favourites. Reach out to your picks to find out if they're available on your preferred wedding date and to double check that they can comfortably host your entire wedding guest list. Then make some room in your schedule for an in person visit to each. Don't put off this important item on your wedding to-do list! Your visit will be more than an opportunity to check out a venue; you'll also have a chance to ask your guide (usually the sales manager or wedding coordinator) lots of questions about how the facility handles weddings. Be sure to ask about the different wedding packages and how they're priced, when deposits are due and what you'll need to do to secure the venue, if there will be a day-of coordinator on hand to keep things running smoothly, and whether you can design your own menu. From there, ask about anything you like. There's no such thing as a silly question when it comes to your wedding! As satisfying as it will be to have finally found the perfect wedding venue in East Ayrshire, you'll still have plenty to do before you walk down the aisle. WeddingWire has all the tools you'll need, from a table planner to our wedding dress catalogue. We're here for you from ‘I will’ to ‘I do’!